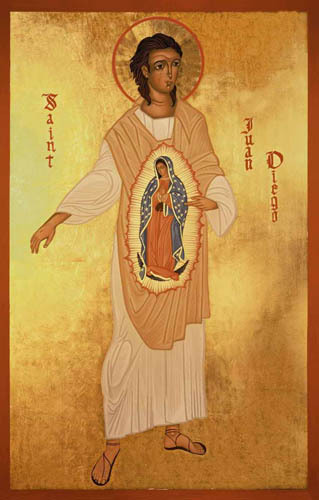 From 1999 TO 2001 the title of this feast day was that of "Blessed" Juan Diego. But on 31st July 2002, Pope John Paul II, in Mexico, canonised Juan, so that he is now "Saint" Juan Diego. Juan Diego was the 57 year old Mexican Indian, to whom Our Lady appeared in December 1531, at Guadalupe (now part of Mexico City.) She appeared to him on three occasions, and finally on December 12th, she left her picture on his cloak. See the full story at "The Guadalupe Miracle"